Did the Phillies give up on local prospect Jesse Biddle too soon? Atlanta Braves relief pitcher Jesse Biddle follows through on a pitch during the eighth inning against the Philadelphia Phillies. The baby fat is gone. Jesse Biddle wears a more sculpted look these days, and a new perspective in a new uniform of the Atlanta Braves. The narrative eight years ago, when Biddle was drafted by the Phillies, was supposed to play out at Citizens Bank Park. On Sunday, it did play out for the Germantown Friends High School graduate and Philadelphia native, though against the team that drafted him. The Jesse Biddle envisioned by the Phillies when they selected him with the 27th overall pick in the 2010 draft is beginning to emerge. This city has always been good to me, and I hope the city appreciates the fact that I do work hard and I will always love Philadelphia. From then until now, Biddle, who is 6-foot-5, and a svelte 220 pounds, has endured more than his share of ups and downs. His career has been stunted by a torn elbow ligament that required Tommy John surgery and years of finding his confidence amid smaller, nagging injuries. In four appearances with the Braves, Biddle, now a reliever, is 1-0 with a 0.00 ERA in four appearances, giving up four hits in 6.1 innings pitched. It’s taken some time, but Biddle feels settled and content. He’s always been his harshest critic, and some of that self-reflection in the past was cutting. Now, it seems past Biddle, who definitely falls under the category of a “good locker room guy” and a positive presence with his affable disposition. Biddle’s otherwise unceremonious homecoming was capped by a ninth-inning double he hit down the line to drive in a run. It was Biddle’s first major league hit and RBI. He laughed afterward, because it didn’t look very pretty – Biddle thought the ball was foul and almost tripped over first base as he headed toward second. Above everything, Biddle looks like he’s going to be a factor in a Braves’ bullpen that combined for 3.2 innings of hitless relief in their 10-1 win over the Phillies on Sunday. And Atlanta, at 16-11 and tied with the Phillies for second in the National League East, will be fighting it out with the home team this year for what could possibly be a wild card playoff berth. 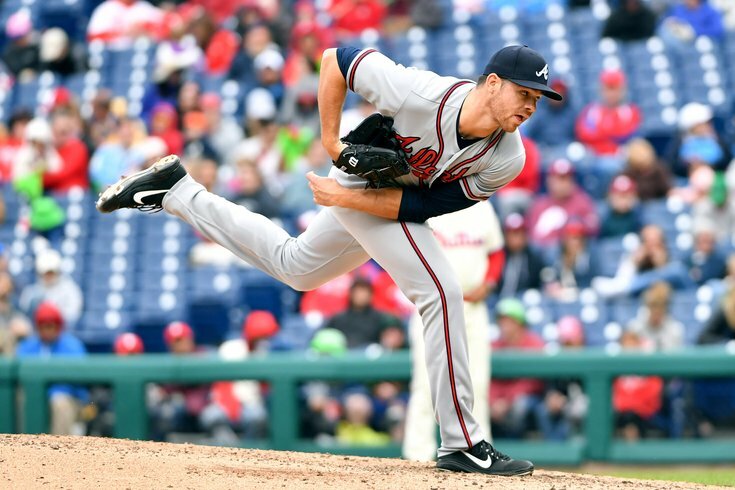 Traded to the Pittsburgh Pirates before spring training in 2016 and claimed off waivers by the Braves a few weeks later, Biddle hopes his injuries are in the past and seems to have caught on in Atlanta. “I feel really good, and this is a good feeling,” said Biddle. “I’ve been getting a lot of positive feedback from the coaching staff here with the Braves. I’ve been injured more than I’ve been healthy with the Braves, but they’ve had my back for a long time now. I’m just happy that I’m being given an opportunity. That’s all ask." He relished the opportunity to return to the Bank. "This meant a lot this weekend to be in this stadium and hear the cheers and chants for my name when I was announced,” he said. It appears to be a feeling Biddle wants to remember. Tucked in a white leather travel bag in front of his locker was the ball he pitched to secure the final out against the Phillies on Sunday.